My name is Austan Najmi-Beauchamp. I am 10 years old and my great uncle fought in World War II and this painting is to honour his life. He wrote letters home to his family. At that time, the soldiers dealt with boredom and their morale was low. Thus letter writing became a source of inspiration and connection with loved ones at home. Communication from home provided comfort and distraction for soldiers. All letters and parcels were censored so secret information did not reach the hands of the enemies or bad news reaching home to upset family members. Today we would think it would have been unethical to open their private mail, but on the other hand it would have risked lives and our freedom. I want to show that men and women, both equally sacrificed their lives by being in war zone and fought in different capacities for freedom. Women helped with casualties and they too saved lives. We cannot forget their sacrifices and suffering of dealing with dying and injured soldiers. 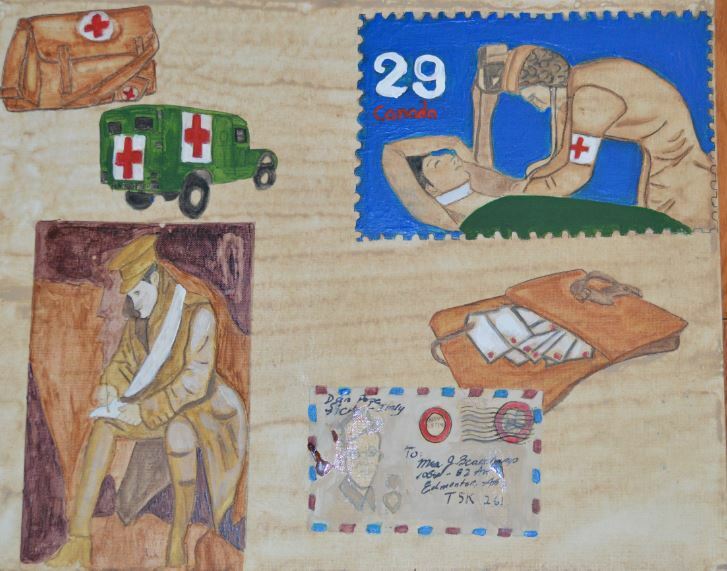 My painting shows a soldier writing a letter during war time and an envelope that the letter was sent. The one mail bag shows how thousands of soldiers longed to be home. The medical ambulance truck transported the wounded to medical facilities where women healed the wounds of the soldiers. They went through mental tortures seeing soldiers die and lose limbs and body parts. They gave medical attention with limited supplies in their medical bags. There were 2 billion letters and 114 million parcels sent home by the end of World War. In future, these letters would shed a light on the lives of soldiers and how they fought psychologically, emotionally, spiritually and physically within themselves and these letters would show how they lives on a daily basis.